Social Denter: Quaid e Azam! This is what you never deserved !!! Quaid e Azam! This is what you never deserved !!! 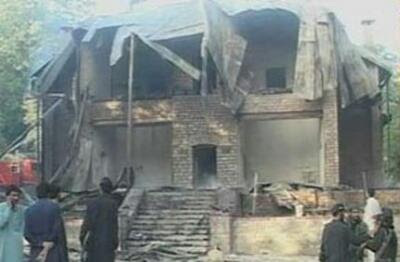 The residence of our beloved Quaid e Azam was targeted with a bomb and it resulted in destruction. Just a news as usual in Pakistan. But do we carry some mind, some feeling , some conscious, some love,some patience, some regard, some words of praise n thanks, some ideological social and ethical regrets and some tears to shed at this occasion??? As I mentioned in my previous post that we are still living under the shadows of slavery. Usual is what we proved at this occasion. Just take a break of few moments, look inside you and think about what we are getting and what all our actions argument to what we deserve as a nation!!! We as a nation have gone deaf and dumb, the reality is we have been tangled into so many pity and unimportant issues by our elders and leaders that now even such big disasters seem so small and we just turn our faces away. Just imagine how many people are dying in this country on daily basis, but what is the outcome. My dear, we, over the period of time have earned this and we have to accept one thing that THIS IS OUR REALITY, Come what may we boast about ourselves but reality is we have turned inhuman..
Rightly said indeed Usman bro..The dilemma is no one seems interested in resolving these issues, rather they say these issues are not even us..